It's okay to put all your eggs in this impressive basket because it's filled with all the gourmet treats and fun toys that are essential to Easter morning! Brimming with gooey marshmallow candies, classic milk chocolates, and a beautifully crafted stuffed rabbit, this impeccable gift will easily make this Easter one they'll remember forever. 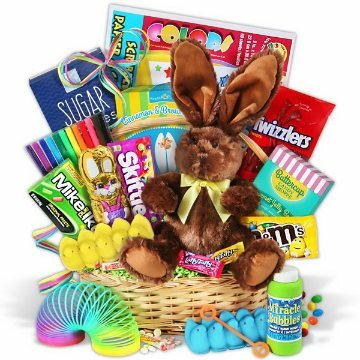 This gift includes the following: Bunny with Ribbon Bow, Jelly Beans by Buttercup Candy Shoppe - 3.5 oz., Cinnamon & Brown Sugar Popcorn - 1.4 oz., Sugar Cookies - 4 oz., Double Crisp Chocolate Bunny - 4.25 oz., Strawberry Twizzlers 2.5 oz., (2) Peeps - Assorted Colors, (2) Laffy Taffy - Assorted Flavors, (2) Smarties - Assorted Flavors - 7 g., Peanut M&Ms - 1.69 oz., Mike and Ike Original Fruits - 5 oz., Wild Berry Skittles - 2.17 oz., Bubbles with Wand - 8 oz., Rainbow Slinky, Scribble Pad of Paper - 60 Sheets - 9" x 12", Fine Point Washable Markers - 12 Piece Set.